The collected works of Tim Maytom + Alex Spencer. Look on them, ye mighty, and despair. Most of the plot in this episode revolves around Newport Beach’s cotillion ball – a swanky event and, according to Wikipedia “the venue for presenting debutantes during the debutante season”. 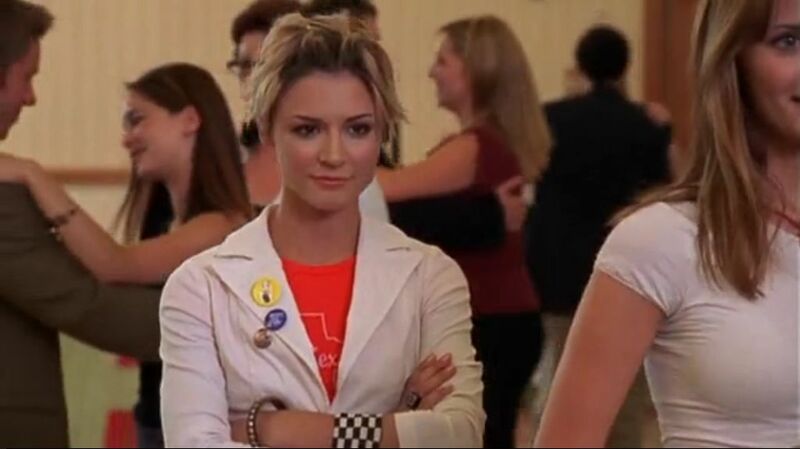 I’m not sure how common a tradition this is in the US – the Wikipedia entry on debutante balls tells me that they also feature in Gossip Girl (also created by Josh Schwartz), Gilmore Girls, She’s The Man and CatDog. Ignoring that last one, the implication seems to be that these type of events are reserved for the upper crust, so as much as I’d like to mock the US here, I’m certain we have traditions twice as dumb amongst our rich folk. For our cast of characters, cotillion represents both tradition (which Ryan is disrupting) and wealth (which Jimmy is threatening with what is increasingly looking like a Ponzi scheme, five years ahead of Bernie Madoff). Those two strands of plot converge around Marissa, who is increasingly chafing against the restrictions of her life in Newport. While Ryan represents an escape from those things, the events surrounding her father also mean that old life is being destroyed, forcing her to jump when she’d maybe rather just dip her toes in. It’s a smartly-constructed bit of plot timing that makes a lot of her later issues kind of understandable – so much of teen rebellion relies on having that safe home to return to, but when that is being torn apart, it’s bound to spiral out of control. The other big development here is the introduction of Anna Stern, and it’s here that we have to address the elephant in the room. Series creator Josh Schwartz has been fairly transparent that Seth is an author avatar for his own teenage self, a Jewish kid from a wealthy coastal neighbourhood. Schwartz was only 26 when he started show-running The OC, meaning that he was still relatively close to Seth’s age. If Seth is the author avatar, then Summer and Anna represent teenage wish fulfilment, something that will become especially egregious later this season as the two vie for Cohen’s affections. Anna, who is interested in all the same things Seth is, down to calling comic books ‘graphic novels’ (this is an Incorrect Opinion), feels like Schwartz’s Canadian Girlfriend, You Wouldn’t Know Her She Goes to Another School, brought to life. Of course, just because a character starts their fictional life this way, doesn’t mean they have to continue along that path. We know that Summer evolves into a more well-rounded character (at the moment her main defining trait seems to be ‘boy crazy’ but she’s started to get some personality) but I honestly can’t remember if Anna ever becomes anything other than a Manic Pixie Geek Girl. I guess we’ll find out together. All these various threads pull together at cotillion, where Marissa picks Ryan to accompany her, Seth opts to stick with Anna, and Jimmy’s financial misdeeds finally come to public light, leading to our first brawl where Ryan wasn’t one of the initial combatants (although he gets stuck in pretty quickly). I was going to question why the police are called after a relatively minor scuffle, but the last few days of real-world events have shown that a certain type of (white) person views the cops as customer service for real life, and the attendees of the Newport cotillion would certainly fall into that category. This episode seems to bring a number of plots that began in the pilot to a relative end, or at least move them on to their next phase. Marissa and Ryan’s attraction is now mutually acknowledged; Luke, who is terrible, seems to be rapidly exiting the picture; and Jimmy’s money problems are now out in the open. Now everyone knows where they stand, it’s time to see what they do with that information. 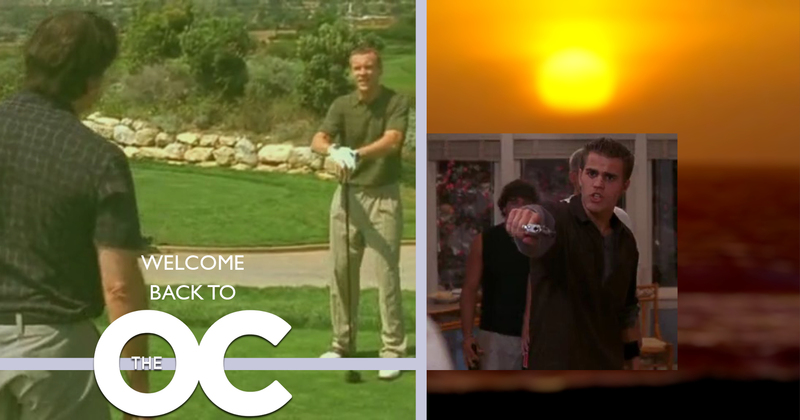 After the tuxedos and fancy dresses of cotillion, this episode swings the pendulum back the other way for some raucous parties and our cast dealing with the seedier side of life, as represented by future Vampire Diaries star Paul Wesley (credited here as Paul Wasilewski). 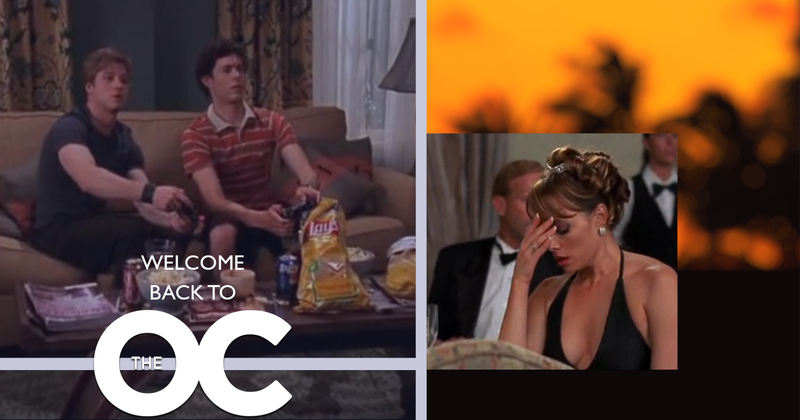 Of course, it’s still The OC, so even an episode that dabbles with the ‘wrong side of the tracks’ features Kirsten at a luxury spa and our teenage characters eating lobster by the beach, like your typical American youths. Despite the promise of class conflict inherent in its premise, The OC has been relatively loath to tackle the issues of wealth and privilege head-on, beyond people giving Ryan the stink eye. Donnie, who gets to know Ryan when he starts working at The Crab Shack, is the first character we’ve seen who actually addresses the level of wealth that the average Newport Beach resident displays, and the fact that a whole legion of service staff exist to cater to their whims, forced to live elsewhere thanks to sky-high house prices. It’s disappointing to see the show decide to cast its first character who is openly critical of the class structure as a villain. The show seems happy to include implicit criticisms of the wealthy through the presence of Ryan as a noble outsider and by showing the kind of unscrupulous behaviour we see from characters like Jimmy Cooper, but the fact that Newport Beach is going to remain our setting and most of our characters come from wealth means that any explicit conversations are off the table at the moment. At least we have Kirsten at the spa, calling out the other wealthy housewives (I feel like I’m going to need to develop a better name for this group) for their hypocrisy when it comes to Jimmy’s behaviour, and Sandy, encouraging Jimmy to make the right decision when it comes to owning up to his crimes and making amends. The show seems to want our sympathies to lie with Kirsten, Sandy and Jimmy at the moment, but given that it takes all episode and some considerable hectoring for Jimmy to stop being selfish, it makes Kirsten’s lecture to the spa crew at lot harder to swallow. Also, Julie’s still largely drawn as a selfish wife and terrible mother at the moment, but in my head she is the more rounded character she will later become, and seeing her repeatedly dunked on is getting wearisome. A lot of her issues with Jimmy and with Kirsten are perfectly legitimate. Talking of WASPy repression, it’s hard to view this episode without applying some heavy queer subtext to Ryan and Seth’s growing ‘friendship’. When Ryan gets a job at The Crab Shack, not only does he get a beefy new friend who’s a rebel just like him, he also can’t spend as much time with Seth, relegating Cohen back to the sad and lonely life he had before Ryan appeared. Then, when Ryan abandons Seth’s IMAX experience for a date with Marissa, Seth starts partying with Donnie, making Ryan uncomfortable and driving the two further apart. But when our new vampire friend pulls out a gun at Holly’s party, Seth’s first call is Ryan, who immediately abandons his date with Marissa to rescue his friend in an extremely poorly-thought-out intervention. Don’t tell me that’s not a love story. Outside of the spa and Donnie storylines, we get some more development on the Marissa front. She gets to have a full-blown Bechdel-passing conversation with Summer, she and Seth have a nice moment when he admits to screwing up her and Ryan’s plans, then she and Ryan have their official first date, complete with spontaneous pool action. It’s nice to see their relationship starting to evolve beyond just ‘I’m attracted to your mysterious energy’, and given that I doubt Luke was ever willing to simply sit and listen to her problems, I can see why Ryan is so appealing. While I’m happy to see the female characters continue to gain some additional dimensions, I have less time for Sandy and Jimmy bro-ing out and whinging about the fact that they don’t get to enjoy a steak or go golfing anymore. Sandy, you literally spend 40 per cent of your time surfing as far as I can tell! I get that both of them seem kind of isolated in Newport, Sandy from his own outsider status and Jimmy, first from the guilt of losing everyone’s money and then from his crimes coming to light, but come on guys, it’s not like your wives are keeping you chained inside your huge houses. At the end of the episode, Kirsten and Julie finally get to hash out at least some of their issues, and we get our first decent insights into the mind of Julie Cooper. The decision she’s left with at the end of the episode, and her subsequent choice, will have a lot of repercussions, so it’s great to be given a glimpse beyond the velour tracksuit before it happens. 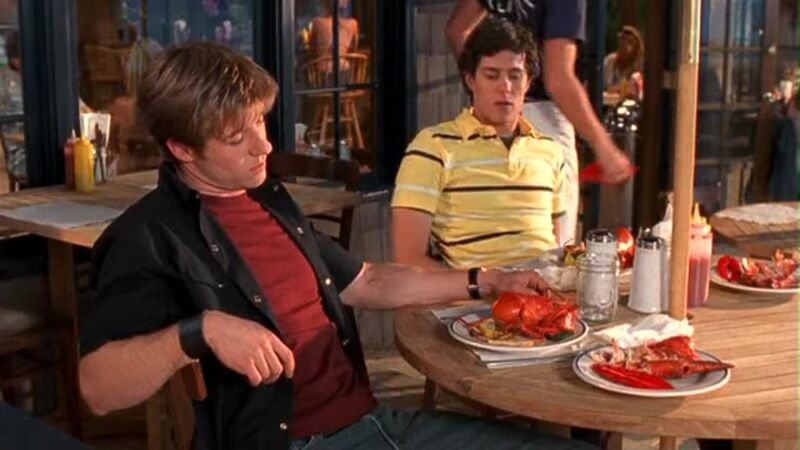 As more details of Jimmy’s financial schemes come out, I’m increasingly aware that in an alternate universe, The OC is a mid-2000s teenage version of The Good Fight. I really like Seth’s green and white striped jacket in “The Debut”. Greg Fischer, who punches Jimmy, is played by Christopher Cousins, who will go on to play Ted Beneke from Breaking Bad. Jimmy should have got Huel in for protection. We briefly see a close-up of Ryan’s thumbnail at one point and it’s nasty. Get some zinc, Ben! Anna uses Princess Mononoke as an insult for Marissa at one point, but clearly Anna (or rather the writers) haven’t actually seen the film, because there’s no actual Princess Mononoke. And if they’re referring to San, she’s an absolute badass. When Seth and Ryan head to the party in Long Beach, the musical sting used to identify that it’s full of raucous roughs is… The Black Eyed Peas. Marissa and Ryan’s first date menu: leftover mac and cheese, followed by grilled cheese sandwiches (or possibly the other way around). I’m shocked they managed to float when they jump in the pool. What exactly is Bad Donnie’s plan at Holly’s party? Shoot a water polo dude and then get back to partying? Seth’s Longbox: These episodes see characters reading Action Comics vol 1 #804, JSA vol 1 #49 and Legion vol 1 #20. Definitely showing a DC bias in the reading material. POCOC (People of Colour of Orange County): Barry Wiggins is back as SEC Agent Steve Pearlman. That’s it for these two episodes. What if it's called WandaVision because it's gonna be shot first person, like Peep Show? Reading through an early draft of a project I'm collaborating on with a few pals, and IT IS VERY EXCITING, folks. I know some incredibly talented people.